GIFT BAGS DONATED -- Former Athol Residents Heather and Erik Plotkin, founders of the Tyler Foundation, Inc., recently donated 30 gift bags to families in the 9 North neurology wing at Children's Hospital Boston. The gift bags include gift cards to Bertucci's Restaurant, free parking passes, hot cocoa, cookies and other treats to help make their stay in the hospital a little easier during the Thanksgiving holiday. ATHOL -- Heather and Erik Plotkin, formerly of town and the founders of the Tyler Foundation, Inc., recently donated 30 gift bags to families in the 9 North neurology wing at Children's Hospital Boston. The gift bags include gift cards to Bertucci's Restaurant, free parking passes, hot cocoa, cookies and other treats to help make their stay in the hospital a little easier during the Thanksgiving holiday. 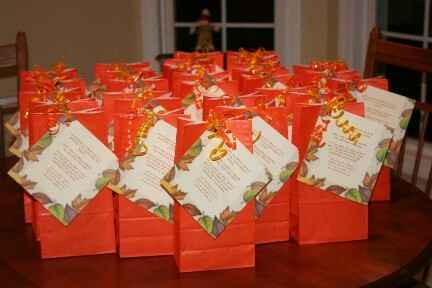 The Tyler Foundation plans to donate 30 more gift bags to families that have to spend the upcoming holidays in the hospital. Any local business or resident that would like to donate items or make a financial contribution can contact the Plotkins at tylerfoundation@yahoo.com or contributions can be mailed directly to the The Tyler Foundation, Inc., P.O. Box 733, Groton, MA 01450. All donations are tax deductible. The Tyler Foundation's mission is to financially support families of children with a brain malformation resulting in seizures that are being treated at Children's Hospital Boston and UMASS Medical Center. Providing meals at a hospital or rehab facility to families of children who are inpatients at Children's Hospital Boston or UMass Medical Center. Providing gas cards to be used by families who are transporting children to doctor's appointments and hospital visits related to epilepsy. Providing financial assistance for the purchase of therapeutic equipment used in the treatment of children suffering from the delayed development caused by the brain malformation and seizures. For more information on the foundation, log onto www.tylerfoundation.org. Heather is the daughter of Cathy White and Dennis Kimball; Erik is the son of Pauline and Richard Plotkin.